"None of us will ever be the same," said Mynda Smith, whose sister was killed at the Route 91 Harvest Festival. "We have all changed. We have all been broken." Hundreds gathered for a sunrise ceremony at an amphitheater in Las Vegas on Monday to mark the anniversary of a mass shooting that left 58 people dead and nearly 1,000 wounded. Among them was Mynda Smith, whose sister, 46-year-old Neysa Davis Tonks, was killed at last year’s Route 91 Harvest Festival. Recalling how her sister liked to dance when no one was looking — and her "energetic, adventurous" spirit — Smith offered a blunt but hopeful view of the grief likely felt by many of those in attendance. "None of us will ever be the same," Smith said. "We have all changed. We have all been broken. But we can find a way to pick up those pieces and glue it all back together. Yes, the cracks will be seen. But it can be whole again and we will be stronger." The ceremony was one of many events planned in Las Vegas and beyond to mark a shooting that targeted a massive country music festival and became the deadliest in modern American history. Country music stations around the country planned a minute of silence. The NHL’s Golden Knights planned to visit a blood drive at the convention center and workers at the Mandalay Bay, the high-rise casino where the gunman opened fire from the 32nd floor. And during an event at the White House, President Donald Trump said his administration was "knocking out" bump stocks — the aftermarket, rapid-fire device used in Las Vegas. "I’ve told the NRA," he said. "Bump stocks are gone." At the amphitheater in Las Vegas, Nevada Gov. Brian Sandoval offered a somber message to the first responders, relatives of victims and elected officials. "Today, we remember the unforgettable," he said. "We comfort the inconsolable." "Today, we are reminded of the pain that never really goes away," he added. Christie Kraemer, a Las Vegas real estate agent who wasn’t at the concert but knew people who were, said: "I never want Oct. 1 to happen again. But I love Oct. 2 because of the way everyone came together." Shooting survivors Chris and Larisa Rapanick of Chesapeake, Virginia, made the trip to Las Vegas for weekend events including a 5K run, a country music club show and a reunion of survivors on Saturday. At the sunrise service, they stood with their two adult daughters. "We weren’t going to let this ruin a place we like to come to," Chris Rapanick said. "I’m glad to be standing here." 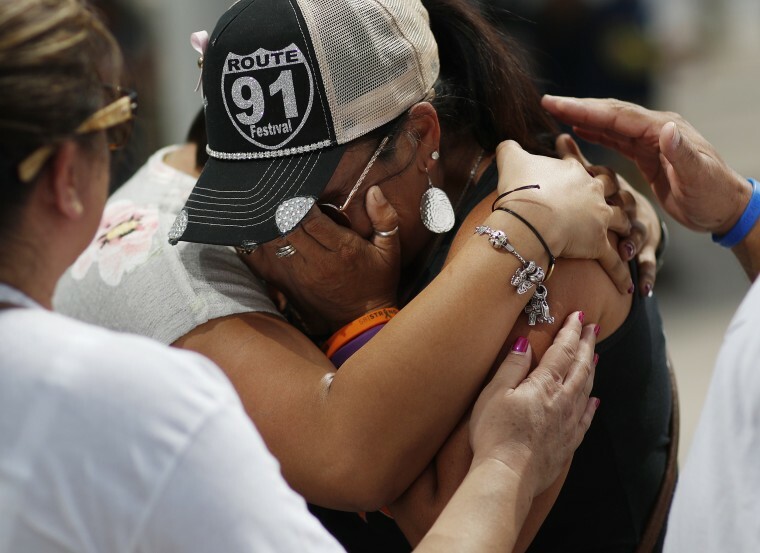 Clark County Sheriff Joe Lombardo recalled the chaos and confusion of the shooting, and the prayers to "heal broken hearts," blood banks filled with donors and "acts of kindness that comforted the suffering" that followed. "When the sun rose the next morning, grief turned to anger, anger turned to resolve and resolve turned to action," Lombardo said. Many who were cheering Jason Aldean’s headline set on at the Harvest Festival late Oct. 1, 2017, said later they initially thought the rapid crack-crack-crack they heard was fireworks — until people fell dead, wounded, bleeding. The Rapanicks heard bullets hitting a canvas awning near them as they fled and saw a shot hit a plastic cup that flipped in the air. From across neon-lit Las Vegas Boulevard, a gambler-turned-gunman with what police later called a meticulous plan but an unknown reason fired assault-style rifles for 11 minutes from 32nd-floor windows of the Mandalay Bay hotel into the concert crowd below. Police said he then put a pistol in his mouth and killed himself. Medical examiners later determined that all 58 deaths were from gunshots. Another 413 people were wounded, and police said at least 456 were injured fleeing the carnage. Lombardo declared the police investigation over in August, issuing a report that said hundreds of interviews and thousands of hours of investigative work could not provide answers to what made Stephen Craig Paddock, 64, a former accountant, real estate investor, small plane pilot and high-limit video poker player, assemble his arsenal and attack the concert crowd. Paddock was characterized by police as a loner with no religious or political affiliations who became obsessed with guns, spent more than $1.5 million in the two years before the shooting and distanced himself from his girlfriend and family. Paddock’s gambling habits made him a sought-after casino patron. Over several days, Mandalay Bay employees readily let him use a service elevator to take suitcases to the $590-per-night suite he had been provided for free. The room had a commanding view of the Strip and the Route 91 Harvest Festival concert grounds across the street. After breaking out windows, Paddock fired 1,057 shots in 11 minutes, police have said. Jim Murren, the chief executive and CEO of MGM Resorts International, issued a statement calling the shooting "an unforgettable act of terror." MGM owns the Mandalay Bay hotel. "Oct. 1 will forever be a day of remembrance, reflection and mourning as we struggle to comprehend the incomprehensible — the senseless act of evil that caused such a tragic loss of life, along with the suffering that we know continues," Murren said.